Now available in English, Chinese, and Vietnamese! The print version is available at Amazon | Barnes & Noble as well as at your local independent bookstore! 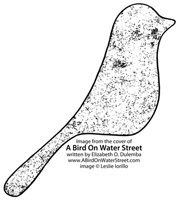 A Bird on Water Street will make a perfect Common Core Curriculum tie-in to Earth Day studies as well as Reading (Literature), Science (Geology, Ecology, and Biology), Social Studies (Mining, Community, Union Labor, and Capitalism), Geography, History, and environmental responsibility every day of the year. CLICK HERE for the Teachers Guide! This book is ten years in the making and began when my husband and I moved to the North Georgia Mountains where the story takes place. We were invited to a town meeting where a scenic railway was being discussed. It was to be funded by one shipment of sulfuric acid per week from the then closed copper mine. Miners stood up like bent and gnarled trees in their flannel and denim, sharing heart-breaking stories of loss from the cancers believed to be caused by the mines. They made thinly veiled threats that the tracks would be sabotaged if plans moved forward. I sat in shock, wondering what I had stumbled into. Ten years later, the book is a testament to growing up in the moon-like, yet close-knit community in 1986, and the efforts toward reclamation which continue to this day. It's a story of man's impact on our environment, and hope for our future as better stewards of this Earth. I look forward to sharing A BIRD ON WATER STREET with 4th to 8th-graders, as well as adults, to show them the history of mining in the community, and the devastation. But most importantly to show them reclamation efforts, leaving them empowered to make choices in their own lives that will have positive impacts on our environment. 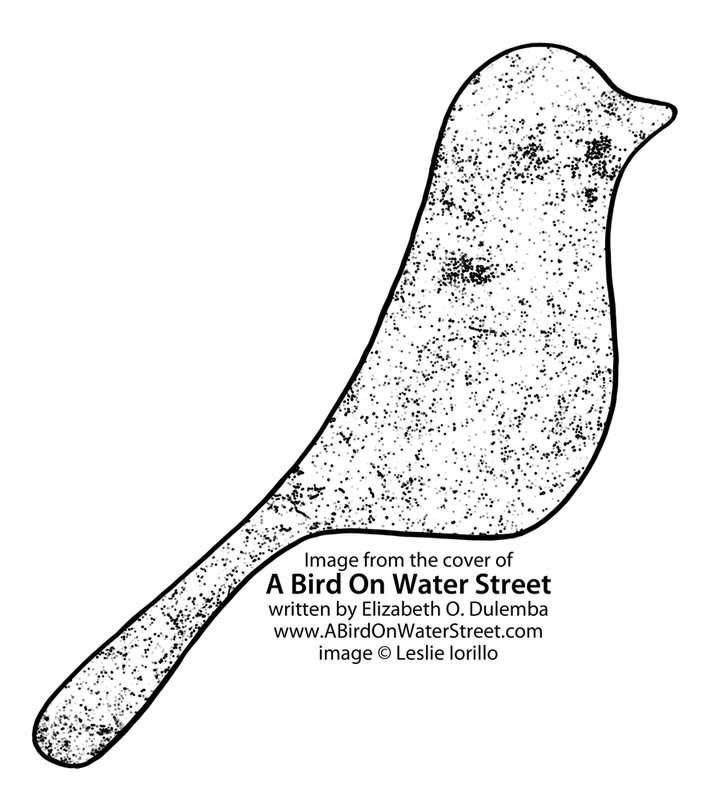 CLICK HERE for more information on the history of copper mining in the Southern Appalachians and A Bird on Water Street. "Historic photographs and an author's note round out a tender story of families and friendships against the backdrop of harsh economic conditions. Hand this quiet tale to fans of Phyllis Reynolds Naylor and Barbara O'Connor." CLICK HERE to read this great review. "A one-company town falters, and amid the human drama, nature begins to reclaim what had been lost." CLICK HERE to read this good review. 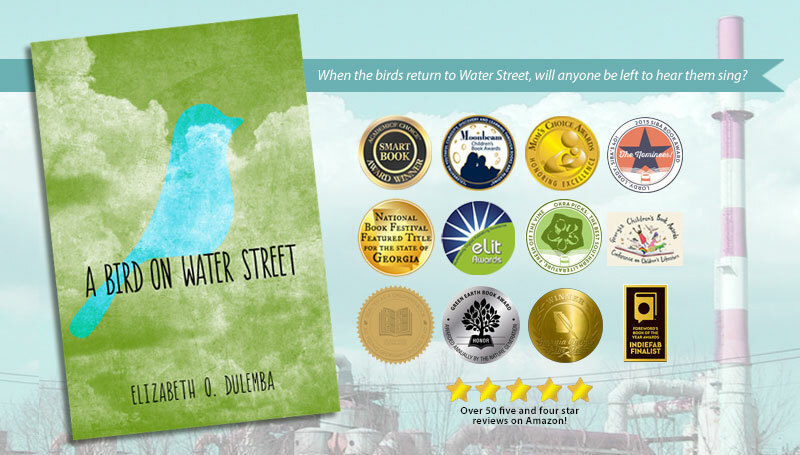 "A Bird on Water Street"... is well written and engaging, and is heartily recommended for public and school libraries, as well as academic libraries with juvenile collections." "Readers will cheer for this determined youngster who is torn between his family's survival and his father's safety." CLICK HERE to read this fantastic review! "Now that my own youth is fodder for historical fiction, I can only hope that books set in the 70s and 80s continue to be as funny, charming, and thoroughly engaging as Elizabeth Dulemba's A BIRD ON WATER STREET. This is a book that sings." "Hard scrabble living was never so enticing. In A BIRD ON WATER STREET, Dulemba seamlessly melds a coming of age story to the reality of life in a single industry town. A book that makes the leap from one era to another with ease." "A little known but important chapter in United States history springs to life in A BIRD ON WATER STREET. In this heartfelt story about a boy who loved nature in a place where not even insects could exist, Elizabeth Dulemba gives a sympathetic inside view of the lives of the families who worked in the mines that poisoned both themselves and their environment. As big-hearted and joyful as it is sobering, this book should be required reading for students studying the impact of man upon the environment and how nature can make a comeback when given a chance. I will never take a sparrow—or bugs—for granted again." – Vicky Alvear Shecter, Author of Cleopatra's Moon and Anubis Speaks!
" 'A Bird on Water Street' is a warm-hearted, lovingly researched story, full of rich detail. Thirteen year old Jack Hicks, who wants to bring the forest back to his home town, blighted by copper mining, is a truly engaging narrator." Read this fantastic review at Irene Latham's blog - CLICK HERE. Check out reviews of A BIRD ON WATER STREET on Goodreads! CLICK HERE to read a collection of reviews from various platforms. 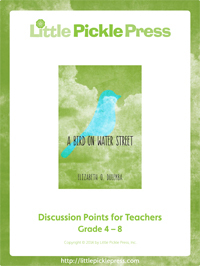 A Bird on Water Street is a highly environmental novel, perfect for your Earth Day studies as well as geography and science studies about environmental responsibility throughout the year. A teacher's guide will be available to help walk students through key issues in the book. The visit will be most effective if students have read the book prior to Elizabeth's visit. Elizabeth will share the history of copper mining in the Southern Appalachian Mountains. She has a prepared slide-show and ore samples to help students understand this unique and all-too-real history of this little known corner of America. The goal of Elizabeth's talk is to show both the devastation and the reclamation efforts, teaching students how to become better stewards of our planet. This talk is for writers' conferences and classes. Writers are often asked, “Where do you get your ideas”? Sometimes that isn’t the problem. Sometimes a story knocks you upside the head and wraps its hands around your neck, demanding to be written. What does a writer do in that situation? How can a writer be true to a story that is perhaps bigger than she is? Award-winning children’s book author/illustrator Elizabeth O. Dulemba will walk you through the creation of her historical fiction mid-grade, A BIRD ON WATER STREET. She’ll demonstrate how to dig out the core of a story and move beyond expected and unmarketable clichés. She’ll discuss the processes of research, interviews, selective writing, and creating a solid story despite the meanderings of epic tales with their own agendas. Please read above for details about this presentation. 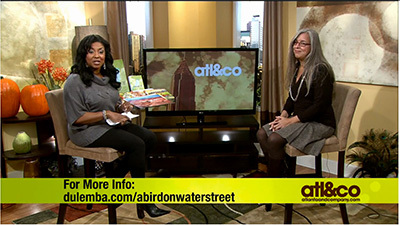 November 7 - I was interviewed on Atl &	Co.
May 7 - A BIRD ON WATER STREET is born!!! 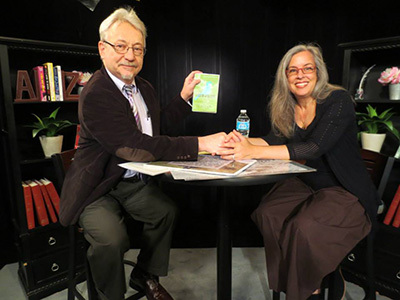 May 7 - Cynthia Leitich Smith's blog, Cynsations - topic: "What To Do When A Story Finds You"! May 8 - Interview at the blog Kissing the Earth - Topic: the impact of landscape in a story. May 9 - Kirby's Larson's Blog Kirby's Lane - topic: "Research Interviews, Getting the Good Stuff"! May 10 - 11:00am Blue Ridge, Georgia - the Blue Ridge Mountain Arts Association, open to the public! May 13 - Janice Hardy's blog at Fiction University - Topic: "How To Tackle a Story That is Bigger Than You." May 13 - I'll be interviewed by James Taylor for his "Writers in Focus" television show. Click here to watch! May 14 - Brian Lies blog, "Getting Into Character" - Topic: I talk about one of my favorite book characters. May 16 - Interview at Sue Poduska's blog, "5thgradereading.net" - Topic: The story behind the story. May 16 - 10:00am Benton, Tennessee - the West Polk County Library will host me as I talk to students and patrons about ABOWS; then at 1:00pm Ducktown, Tennessee - the East Polk County Library will host me to do the same! And a grant has provided free copies of ABOWS to these Copper Basin readers! May 17 - The CITY of Copperhill, Tennessee (where the story takes place) is going to throw a city-wide shindig for ABOWS from 11:00am - 3:00pm, and folks who I interviewed will share their stories on stage with me! May 19 - Darcy Pattison's Blog, Fiction Notes - Topic: "Editing (a.k.a. Puzzle Building)"
May 19 - 7:00pm Brasstown, North Carolina - The John C. Campbell Folk School will host me for a reading and book signing! May 21 - Janet Fox's blog, Through the Wardrobe, where I'll talk about "Why I Write For Teens"
May 23 - Interviewed by fellow author Hillary Homzie at "The Mixed Up Files"
August 11 - Host: WCHE 1520, Philadelphia Libby's Luncheonette (serving up local sustainability) theme: "Turning Today's Youths Into Tomorrow's Activists"
August 17 Guest post at Nerdy Book Club: "Switching Genres: Surprise, It's a Novel!" Email now to secure a date for Elizabeth to speak at your school or festival!